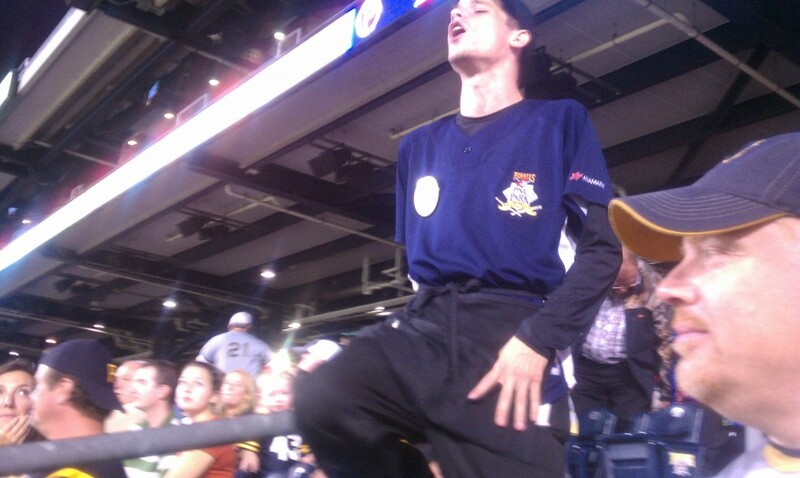 While attending the Buccos game on Saturday night a soft pretzel vendor walked our section at one point. He was young. One of the youngest vendors I’ve ever seen at the park. I’m a horrible judge of age, but let’s say early twenties. He stood on the steps about five feet below our aisle seats with his pretzel box resting on his head and waited for someone to buy a pretzel. He scanned the crowd intently, hoping to see a hand pop up. He then marched up the steps a bit of ways until he was standing three steps above our seats. I figured he had given up and was on his way to another section where maybe the people weren’t so prejudiced against soft pretzels. Then he put his pretzels down, put one leg up like Captain Morgan and proceeded to belt out an AC/DC tune at the top of his lungs. Like he felt it. TNT! And I’ll win the fight! TNT! I’m a power load! TNT! Watch me explode! And just like that, I was a fan. And just like that, he sold half a dozen pretzels to appreciative fans. Who is this dude? I tried to hunt him down, but I never found him again. I’d love to know his name. Just in case he’s the next Kenny. The next in a long line of annoying vendors who I wish would go away while I’m trying to watch a game, that’s who he is. This guy, and “whistles” (the bald fat dude that whistles all the time and says annoying, unfunny, non-sequitor things like “Hey hey, Lady GaGa! Consol Center! She’s coming!”) are a big part of why I used to buy a twenty game plan, then I bought a 10 game plan, and now I’m happy to merely watch or listen on TV. For fans of the game, they simply get in the way. I’ve actually wanted a soft pretzel at games before. And Lemonade. And a beer every now and again. You better believe I didn’t buy them from these guys. He’s been around for a while. He does a good Michael Jackson as well! I loved it! That was actually a highlight of the game for me. Of course I had a whiny, turns out she really was sick, 11 year old next to me so it was hard to enjoy any of it, but he was awesome. I consider myself a fan of the game (attends about 40 or so home games, catch a couple series on the road, take score, etc…) and I like the vendors who show some personality. The pretzel dude does a good job drumming up business (which is how he makes money) and TC (the bald fat dude) has been a fixture at Pirates, Steelers and Penguins games going back 25 years. Yeah, some of the things he says are silly, but then again, it’s a baseball GAME, not a world peace summit. People go to the games for all different reasons, not simply because they are “fans of the game” (whatever the hell that means). Love the vendors and wish we could have gone to more games this year. Whenever we had the time they were sold out. My love and I are BIG time baseball fans and enjoy the game from LL on up. In fact that was one of the criteria for retiring, had to have a major league team. I saw TC selling beer as I was walking into Star Lake for the Jimmy Buffett concert. I recognized him, ran over and took a picture with him. He was genuinely shocked that someone recognized him and went out of their way to say hello to him. That guy is awesome. He was selling nachos earlier this season, and I caught an amazing rendition of You Give Love a Bad Name…. i am a season ticket holder for the penguins and i will tell you and i say with this no disrespect for kenny (r.i.p) but he scared me. truthfully i find all the vendors annoying especially now at the consol that you cannot make it up and down the steps during the breaks in play. and if there is a beer man since that is about the only thing in the consol stands being sold get out of my way! if you want your d*mn beer you drunken fool toddle up the steps and go get it yourself! if your too drunk then sober up! it has nothing to do with what they scream out………..lol however, if they start selling ice cream in my section I might reconsider my view point! yes i’m wishy washy today! Question for jmarinara….did you kick your dog before or after typing your post? So funny! I was at the Pirate game on Saturday and that kid was singing Michael Jackson “Just Beat It!” I thought he got mad at a fan and was telling them to Beat It. I said to myself “I have to Google this later on.” Thanks for finding out for me. Sometimes you just gotta be different and I give the kid credit. What section was this? I’ll be there 9/25 (Fan Depression Day) to render judgment. if this happened at a steelers game, no one would care. because, no one would be able to hear him. Wonder if this is the same guy that grinds on the railing in male stripper fashion when there is a group of girls/women nearby. Not family ball game appropriate if u ask me. Next big thing: Vendors flash mob! That means your husband was near Virginia. Bet he didn’t even know it…. Whoa… I don’t care what he does or what he sings, if there’s a pretzel vendor then I’m happy. I always have to wait on crazy lines just for a pretzel! Seriously, trash talking TC? TC is a Pittsburgh institution. Let me guess you hate Primanti Bros. too? Or poor, and you know, a guy who likes baseball. And when I actually have choices to make about what to do with my hard earned (and way too small) stack of disposable income, I don’t want to go to a place to listen to some dude badly sing, and watch him badly dance, all so he sell some pretzels. I get the guy has to make a living, I even respect that. But I paid good money for a ticket, parking, gas, etc. etc. to watch a game. So please, I’d like to . . . you know. . . watch a game. Of course, I admit, this whole argument of not wanting to waste hard earned money loses a little steam when you consider it’s the PIRATES I’m going to watch. Please. The Steelers are an institution. The Cathedral of learning is an institution. Some 23 year old dude who’s been working at the ball park less than 3 years (probably) is hardly an institution. No, I actually like Primanti’s a lot. I love Pittsburgh too. And for the record, the kid is probably nice and volunteers at homeless shelters and all that. Great good for him. I hope he has a wonderfully successful life when he starts his REAL career. Just stop insisting on being the center of attention when I’d like to center my attention on what I paid to see. And don’t EVEN get me started on the green shirted photographers.